This week I have mostly been getting… a plethora! I’ll tell you, El Guapo – it’s the amount of miniatures I received this week. Better get my brushes wet if I’m ever going to end up on a positive painting count for the year! These I got on monday. They’re from several lots. There are six LOTR Uruks which a friend was clearing out. I also got three painted barbarians from him. 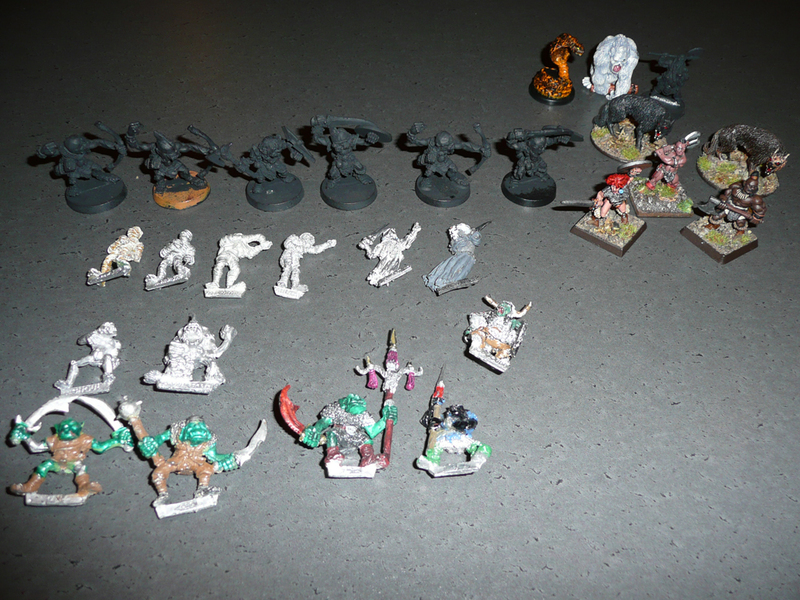 As freebies he included two ‘clix wolves, a D&D plastic flame snake and taer and a Red Box OOP dwarf. I’m not counting those towards the total. Also, there are mummies and wights for Stillburg, a ghoul for my Dungeon Bowl project (Black Widows, really looking forward to push some putty on that team) and an original Plague Bearer that I got just because they are few and far between and I try to get demons for all the Chaos gods. Furthermore, four orcs to my collection and a BC2 hobgoblin (I try to pick up minis from box sets I allready have a few from). So, that’s 19 minis added to the mountain (not counting the painted ones I’m only going to re-base). 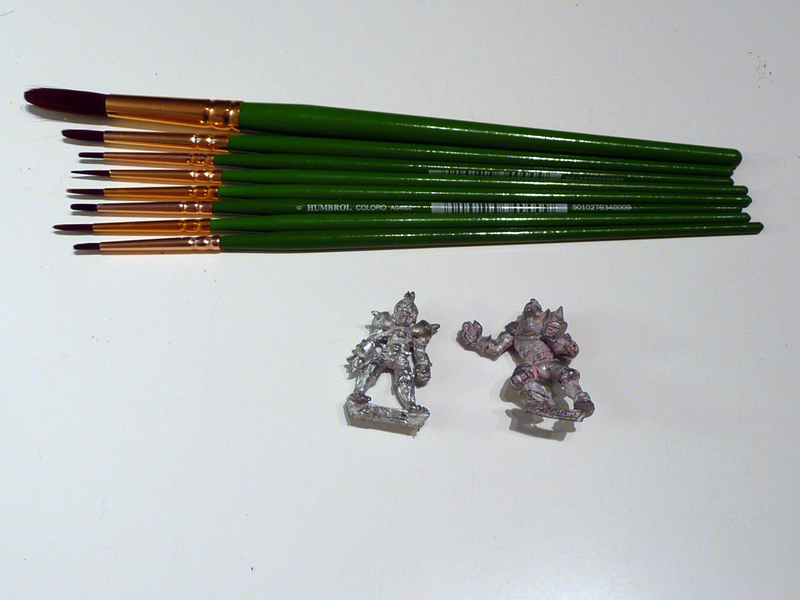 Next day, I got some cheap brushes and a 1st edition Blood Bowl zombie and a 2nd edition human catcher. For the Dungeon Bowl project. The brushes are mainly for a painting workshop I’m holding with a friend’s kids. That’s 21 in total now. Then I got these lovelies yesterday. 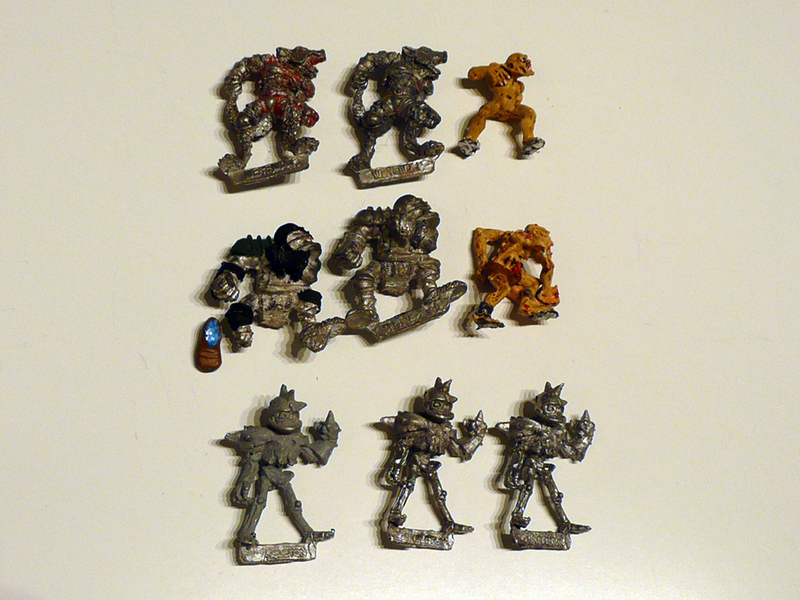 Two Willhelm Chaney star players (to be used as norse werewolves in the Doom Forgers team), two more ghouls and three skeletons for the Black Widows and two orc blitzers (one sans foot, but with a plastic human foot). 9 more added, which brings us to a total of 30 minis. 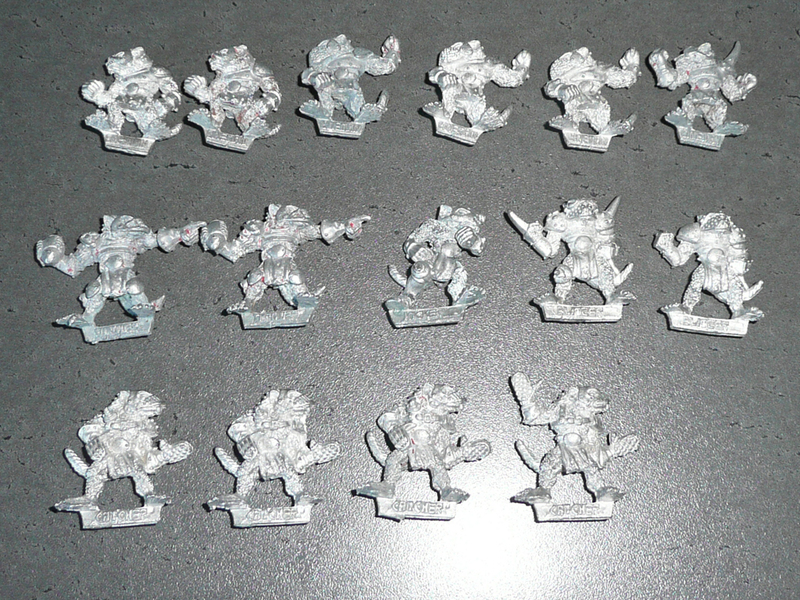 Finally, I got this 2nd edition skaven team. Sculpted by Jes Goodwin (who else?) and just about the coolest Blood Bowl minis ever done. In particular, I love the blitzers and the throwers. Another 15, eh? So, in total 45 miniatures this week. That’s a lot, and not an ongoing trend! Now, if we take into consideration that I’ve sold off more than 70 miniatures the last two weeks, and have about 80 still to sell I could probably say I’ve nullified the growth of the lead mountain. Still, I won’t count those outgoing minis. Just stating for the record (and if my wife reads this) that I do infact have a lesser amount of miniatures today than I did two weeks ago. There. This week I have mostly been getting… chaos! This week I have mostly been getting… Blood Bowl!